This entry was posted on September 10, 2008 at 1:40 am	and is filed under saas, Web 2.0. You can follow any responses to this entry through the RSS 2.0 feed. You can leave a response, or trackback from your own site. I’ve had good success with nuevasync for syncing iPhone contacts and calendar over the air (no iTunes involved) with google contacts and calendar. It doesn’t solve the multi-calendar sync issue you mentioned, but it’s cool, nonetheless. I use Plaxo for keeping contacts. I use iCal and synch the rest to it. But I can tell you how sometimes I get lost around too. Bob, you haven’t experiences true pain until you try to sync all this to differing mobile handsets! LOL. I could tell you stories about this pain. Think about a company where everyone uses a different phone and some folks use Outlook, others web based calendars. Welcome to true pain. Yeah, some folks will tell you, hey that’s what SyncML is all about. But not all phones support it! My company has the original patent holders for sync. They created Sidekick back in the day. To this day, this is still not fixed. Yes, it’s not easy. But there’s no shortage of people trying to solve it. Yeah, we both know those Sidekick guys are brilliant. You have a great team over there at SoonR. Maybe Android will force this all to be fixed. Today the Google software doesn’t sync as well as iTunes with Outlook and I have to believe Android will flop if they can’t do better. I have not had a problem with Google Sync, but my use is different. I often work from desktop to desktop, alternating between Mac and PC. I don’t use Outlook at all. I use Sunbird with CalDAV to synchronize my Google Calendar and Thunderbird for email through IMAP, which work on both Mac and PC. So, rather than using the cloud to synchronize my desktops, I use my desktops to access my cloud services. I’ve come to realize that batch updates are iffy. It’s best when your information is pushed to the server or received immediately. Contact synchronization has been a problem until Google Sync. What was really important to me with respect to syncing, was mobile access. I have a Windows Mobile phone, which only works with an Exchange server. Google Sync has eliminated that restriction. Now, I have almost instant syncing on calendar and contacts with my phone, where contacts actually matter. Of course, email works too. 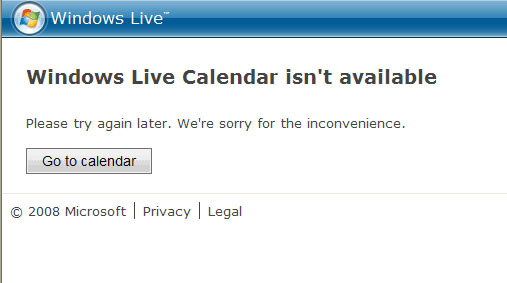 I hear that Microsoft Live is working on a way to sync files between your phone and the cloud.